I am a huge fan of Muri mixture that is sold by bajjiwalas (vendors) along the Vizag beach road. 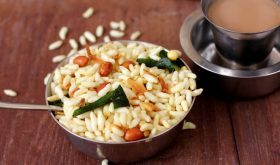 I am talking about the masala murmura which is prepared with chopped onions, tomatoes, chili powder, peanuts, coriander leaves and a dash of lemon juice. Just typing that out made my mouth water. 🙂 I had a huge bag of Muri aka Borugulu/Marmaralu/Murmura that needed to be used up and what better than Murmura Chivda. Ridiculously simple to make with minimal ingredients and hardly any cooking time. Heat oil in a heavy bottomed vessel. Once hot, add dalia, roast on medium flame for little less than a mt, drain from oil and set aside. In the same oil, add cashew nuts and roast till light golden brown, drain and set aside. In the same oil, add green chilies and allow to turn crisp, drain and set aside. In the same oil, add curry leaves and allow to turn crisp, drain and set aside. In the same oil, add grated dry coconut and roast till golden brown. 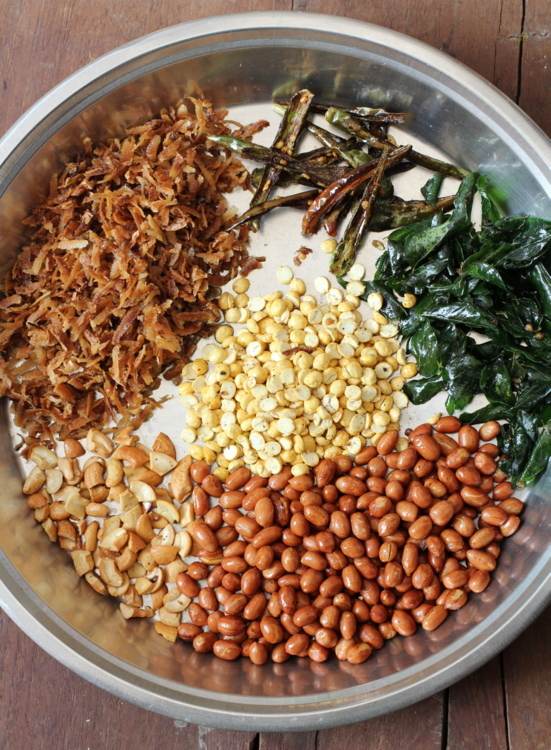 Once it turns golden brown, add all the roasted ingredients along with roasted peanuts and mix them well. Add turmeric powder, salt, sugar and red chili powder and mix well. Add the puffed rice and mix well and allow to roast on low flame for 2 mts. Keep mixing through out. Turn off flame and allow to come to room temperature. Add more oil if required while roasting the grated dry coconut. 4 to 5 crushed garlic cloves can also be roasted and added. 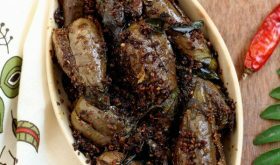 Instead of garlic, 1/4 tsp asafoetida can be added. By Sailu Published: January 19, 2014 Murmura chivda, a popular snack among Telugu people is one of the healthy snacks of India. 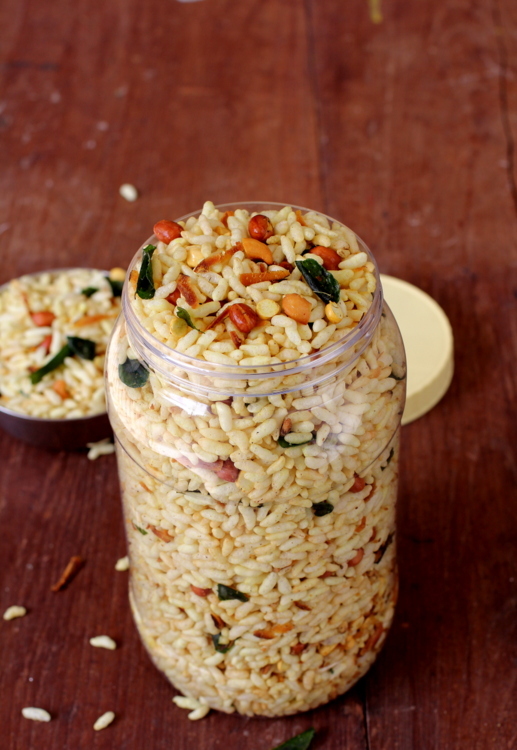 Spiced puffed rice mixture uses dried coconut, dalia & chilies. I would love to make these but i don’t have dry coconut, can i make them without the coconut, or can i substitute with something else. Finla, make it without the dried coconut. You don’t have to substitute with anything else. thankyou will try them soon. Murmura chivda looks tempting, wanna grab it !!! The first line says fresh, crisp murmura, but I have a huge pack that’s gone soft 🙁 in fact I specifically googled this recipe to finish off that pack in a healthy and tasty way. what do you suggest I do? Heat an iron kadai on very heat. Turn off flame. Add the murmura and leave it for a mt and toss. Leave alone for sometime. It will turn slightly crisp but not like freshly bought murmura. Do not use MW.